This narrative has been informed by the urban morphology of the local Thames and Fleet riversides. The proposed river front developments could be based on the spatial concept of an ‘inlet’ - a mediation between the built form and the spatial expanse of the river to maximise access to the water, while managing the scale and enclosure of public spaces between buildings. ‘The Fleet / Hithe’ urban form suggests a strong spatial inlet from the waters edge, with new public spaces created perpendicular to the River Thames. These should contain elements of water or sustainable drainage. ‘The Fleet / Hithe’ should contain high density residential buildings with mixed uses at the ground floor. Residential clusters along the upper slopes relate to the fine grain of ‘The Pinch’ and should be aligned with the contours. Streets and buildings are of a fine grain, with clusters on the areas immediately adjacent to the rivers edge aligned perpendicular to the wharf edge, to maximise views to the River Thames from within the development. 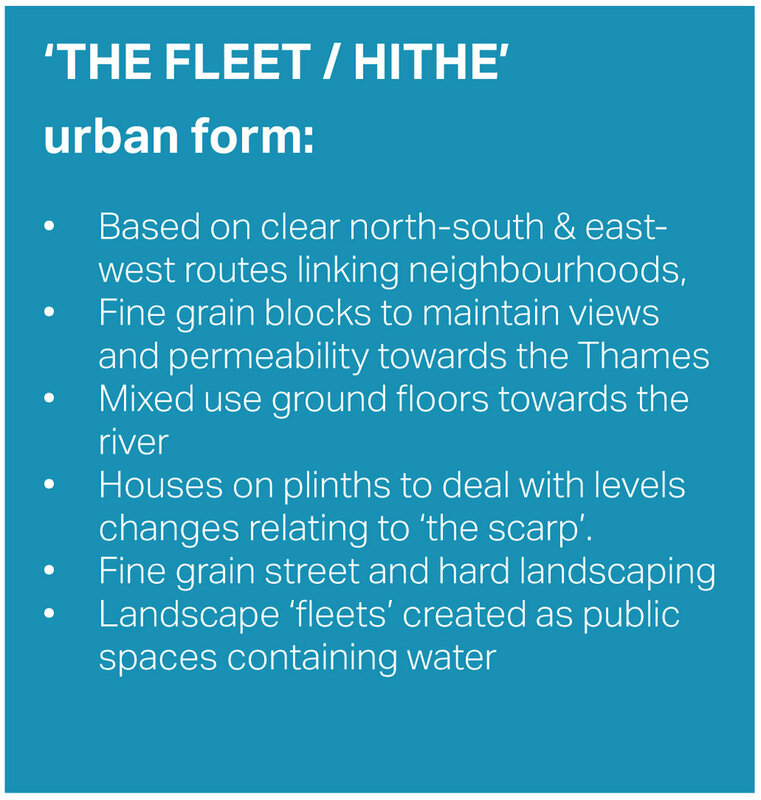 ‘The Fleet / Hithe’ urban form creates a strong and defined neighbourhood focus leading down to the river edge. A new sequence of public spaces should be dominated by their form based on a ‘The Fleet’ or inlet. ‘The Fleet / Hithe’ contains high density residential buildings with mixed uses within an expressed ground floor plinth. Residential clusters aligned with the contours of the steeper topography share characteristics with the urban form of the ‘The Pinch’. Streets and buildings should generate a fine grain development.